We are a leading Manufacturer of compression moulding machine, rubber moulding machine, up stroke rubber moulding press and rubber moulding press line from Coimbatore, India. We have marked a distinct position in the market by providing high quality range of Rubber Moulding Machine. This molding machine is developed using the excellent quality basic components and contemporary techniques in adherence with the predefined standards. Provided molding machine finds applications in checking the strength of rubber bond of metallic bush. 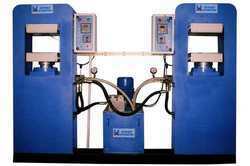 Offered molding machine is known for its low power consumption & optimum performance. 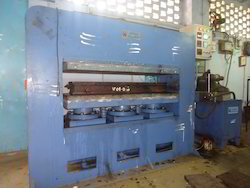 We have marked a distinct position in the market by providing high quality range of UP Stroke Rubber Moulding Press. This molding machine is developed using the excellent quality basic components and contemporary techniques in adherence with the predefined standards. Provided molding machine finds applications in checking the strength of rubber bond of metallic bush. Offered molding machine is known for its low power consumption & optimum performance. With the help of our professionals, we are engaged in providing Rubber Moulding Press Line. Offered bale press is checked on diverse parameters of quality in order to ensure its defect free range from our side. 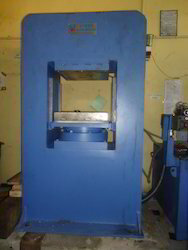 This bale press is developed by using finest quality components in accordance with set guidelines. Our bale press is highly appreciated by our customers for its superior-quality and optimum finish. 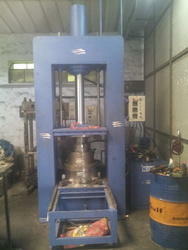 We are a well known manufacturer and supplier of Rubber Moulding Machine for Rubber Industry. Our offered product are highly appreciated and demanded in the market. 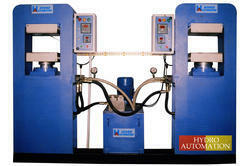 These rubber moulding machine are manufactured under the supervision of our highly skilled professionals. Our customers can avail the offered product at very reasonable prices. Looking for Rubber Moulding Machine ?